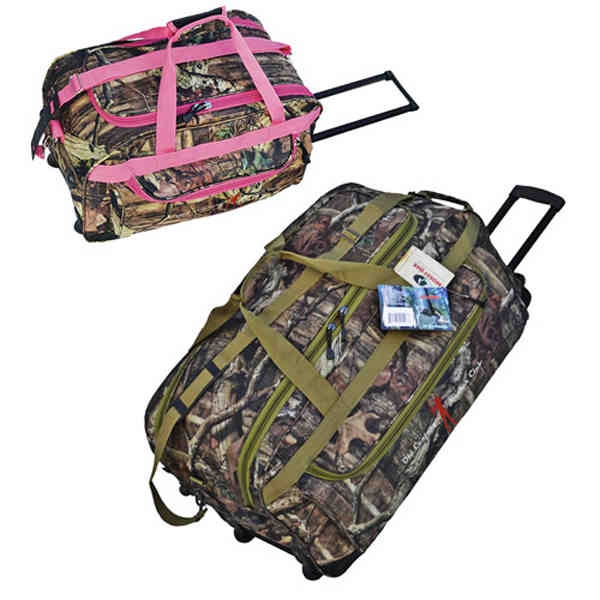 Mossy Oak® camouflage ultimate rolling duffel made of water resistant 600 denier polyester oxford. #10 zippers. Spacious zippered main compartment with long U shape opening for easy access. Large zipped front pocket. Hard wood bottom board. Heavy duty frame with ball bearing wheels. Strong square tube pulling handles. Detachable/adjustable padded shoulder strap. Padded carrying handles on top and end. Heavy duty metal hardware. Size: 22 " x 12 1/2 " x 11 1/2 "